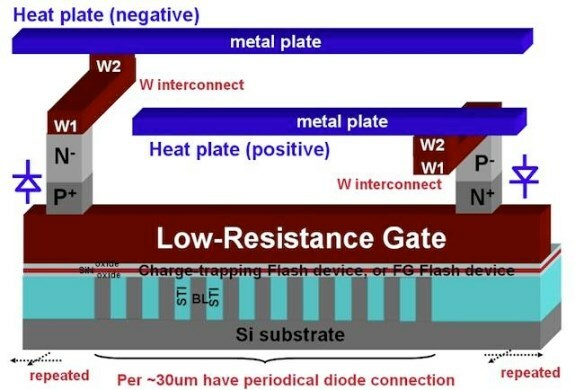 Intense heat is typically an enemy of computer chips but Taiwanese chip firm Macronix claims it has found a way to to create self-healing NAND flash memory chips that use high temperatures (>800°C) to achieve a significantly higher program/erase cycle than possible with current NAND flash memory technology. While typical consumer solid state disks are rated at 3,000 or 5,000 program/erase cycles, Macronix claims using a built-in heater to locally apply high temperature (>800°) for a short time (ms) can increase NAND flash memory's lifecycle to over 100 million p/e cycles. Besides improving the endurance of flash, the process also increases erase times, giving flash yet another speed advantage over HDDs. The company will reveal more information about its technology at the 2012 International Electron Devices Meeting in San Francisco on December 11th. Full details at The Register.